After thirty years, it turns out, yes, dingoes really did eat that baby. At least that was the finding of Australian coroner Elizabeth Morris today, as quoted by the New York Times: "The cause of her death was a result of being taken by a dingo." 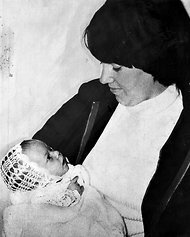 The bizarre disappearance from Ayer’s Rock of infant Azaria Chamberlain in 1980 led to her mother, Lindy, being convicted of murder in 1982, despite Lindy’s claims that dingoes had killed the baby. When Azaria’s jacket was found four years later near dingo dens, however, Lindy was released. Finally, this year, a fourth inquest was taken. In the thirty years since the case, the Australian view of the dingo has changed. Fraser Island, a nature preserve believed to contain some of the last “pure” dingoes (dingoes are a subspecies of wolf, and often crossbreed with dogs) in Australia, has seen a rash of dingo attacks on humans in recent years, probably due to closer dingo/human proximity. Human/dingo contact of any sort was rarer when the Chamberlain infant disappeared. The original case became a media frenzy in Australia, often compared to the O.J. Simpson trial in America. It also had a bizarre life in American pop culture, the phrase “dingoes ate my baby” becoming a kind of pre-Internet meme, appearing in everything from Seinfeld to Buffy the Vampire Slayer, and eventually becoming the basis of a movie, A Cry in the Dark, starring Meryl Streep as Lindy Hamilton. I still think she did it: She belonged to a weird religion and her baby had a funny name! Burn her!! BURN THE WITCH!!! Ahem... Anyway... Did somebody mention dingos? Did somebody mention O J Simpson?